The final product – the Titleist TS2 and TS3 drivers and fairway woods – promises faster ball speed, higher launch, lower spin and increased MOI. It's all about speed, from the distribution of the weight to the shape of the clubhead. 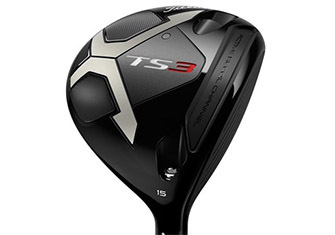 The TS in the name stands for "Titleist Speed", and the new TS2 and TS3 fairway woods have been introduced to give golfers the most speed, the most distance, and the most forgiveness of any Titleist fairway wood in its history. As with the TS drivers, the key to the speed and distance gains lies in the development of the Titleist Speed Chassis, which combines a thinner stainless steel crown (27% thinner than the 917 models) and a variable thickness face that is thinner around the edges. The weight that is reduced with the thinner crown and face is redistributed lower and more toward the back of the clubhead. The result is a higher launch angle and an 11% increase in the moment of inertia (MOI), which is a measure of clubhead forgiveness. The TS2 has a high launch, low spin profile with a modern shape and fixed CG location that spells explosive distance across the face with maximum forgiveness. Players can choose from one of five lofts – 13.5, 15, 16.5, 18 and 21 degrees. The TS3 has a mid-launch, low spin profile with a more traditional shape and a SureFit CG weight system that allows the player to adjust the clubhead for launch characteristics. The TS3 has four available lofts – 13.5, 15, 16.5 and 18 degrees. Both the TS2 and TS3 have an updated Active Recoil Channel (ARC 3.0) that helps reduce spin and increase the launch angle on shots struck low in the hitting area. There are four stock shafts to choose from – the Mitsubishi KURO KAGE Black Dual Core 55 (High launch, moderate spin), the Mitsubishi TENSEI AV Series Blue 65 (Mid launch and spin), the Project X HZRDUS Smoke Black 70 (Low/mid launch and spin) and the Project X Even Flow T1100 White 75 (Low launch and spin). 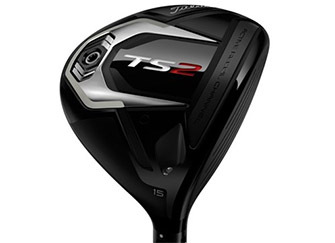 The Titleist TS2 and TS3 fairway woods will be available on September 28, at a cost of $299. But starting today, players can be fitted to a TS fairway wood at fitting events around the country.